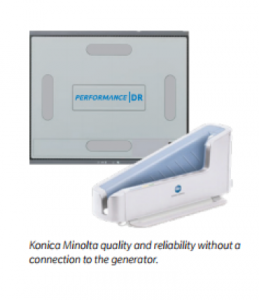 Performance DR | Konica Minolta Healthcare Americas, Inc.
Konica Minolta has created PerformanceDR, the wireless DR solution that offers the convenience of Automatic Exposure Detection (AeroSync®) eliminating the connection to the generator, and the outstanding performance of Konica Minolta Digital Radiography detectors. CS-7 and Ultra feature Konica Minolta’s Hybrid (H) Processing; a unique image processing technique developed to realize superior image quality and improved patient diagnosis and easily integrate with existing RIS and PACS infrastructure to enable the technologist to acquire, view, and complete a study in a smooth, time saving workflow. Private Practice and Outpatient Clinics requiring wireless DR productivity and that have already implemented PACS. It includes Konica Minolta’s PerformanceDR flat panel detector and Ultra Software that simplifies DR image acquisition. PerformanceDR offers only the features needed for primary acquisition. Blue Moon TCO for PerformanceDR is designed to maximize customer satisfaction throughout the lifecycle of the imaging system while helping customers manage their cost of ownership. The support approach from Konica Minolta, in conjunction with Authorized Reseller Partners, creates a simple path for ongoing support. Blue Moon support plans help deliver value and confidence while ensuring the worry-free operation of every PerformanceDR system.